Now that I have a new crock pot, I want to try more of these recipes I find at the hop. thanks. You are right, there is nothing like stew on a cold autumn or winter evening - and yours sounds just scrumptious. I imagine it smells lovely in the crock pot when it's cooking too! Thanks for sharing such a yummy recipe. I bought a bunch of stew meat that I have in the freezer, I need to make a stew!! Your stew looks great! I would really like to have a bowl right now. Thank you so much for sharing your recipe with me. Looks delicious! I'd love to have you share your recipes each week at What's Cooking Wednesday! Hope to see you there! 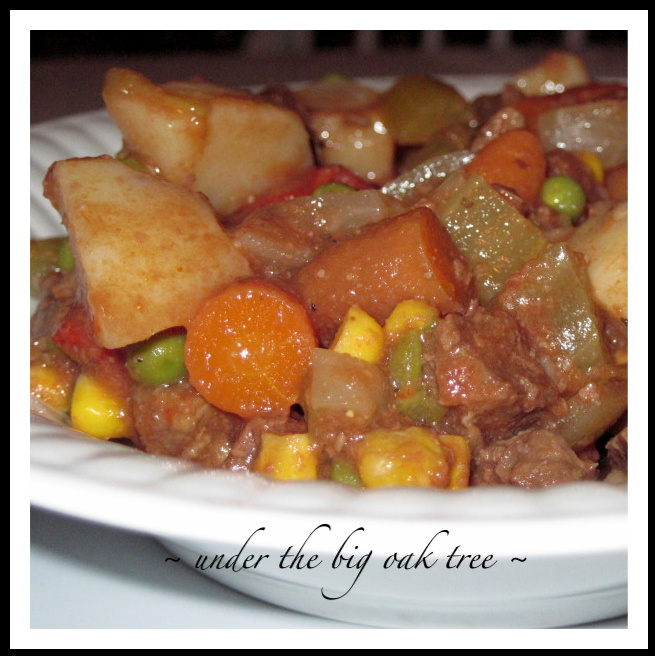 my hubs is a huge fan of stew and i am always looking for new recipes to try. thank you for sharing it with tuesday night supper club. What a good idea for cutting down time in the kitchen, and yet you still get a delicious meal in the end. London Broil? I usually use chuck. Anyway, maybe I'll try LB next time. Happy FF.